The New Development Bank (NDB) of the BRICS countries launched business in Shanghai on Tuesday and will soon set up a hotline with the new China-led Asian Infrastructure Investment Bank. 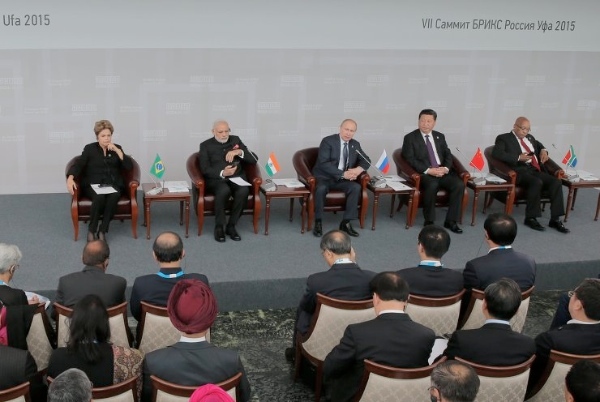 The BRICS countries include the world’s major emerging economies: Brazil, Russia, India, China and South Africa. Chinese Finance Minister Lou Jiwei, Shanghai Mayor Yang Xiong and NDB’s first President Kundapur Vaman Kamath from India attended the opening ceremony held in a hotel in Shanghai. The NDB will help with the recovery and development of emerging economies, said China’s Finance Minister Lou. “NDB is a new member and partner to the global development system. NDB’s support for infrastructure construction will effectively ease the bottleneck that has constrained emerging and developing nations for long and will offer support for their economies’ upgrade and growth,” said Lou. The Chinese Finance Minister also said the BRICS Bank will work closely with the China-led AIIB, as was announced through the Ufa communique at the close of the 7th BRICS Summit in Russia earlier this month. President Kamath said the Bank would look at tapping financial and capital markets in BRICS nations. “Should we approach the financial markets, the capital markets in five BRICS countries to raise local-currency funds so that in a way we break the challenge and the cost of dealing in hard currencies where the exchange rate continues to impact you for a long, long time? Could we start by making substantially large bond issuance in the domestic market? We will have an open mind in terms of the instruments we will use for funding projects,” said Kamath. I appreciate tremendously the informations delivered by your Site . I wish you good luck and peace for the world .